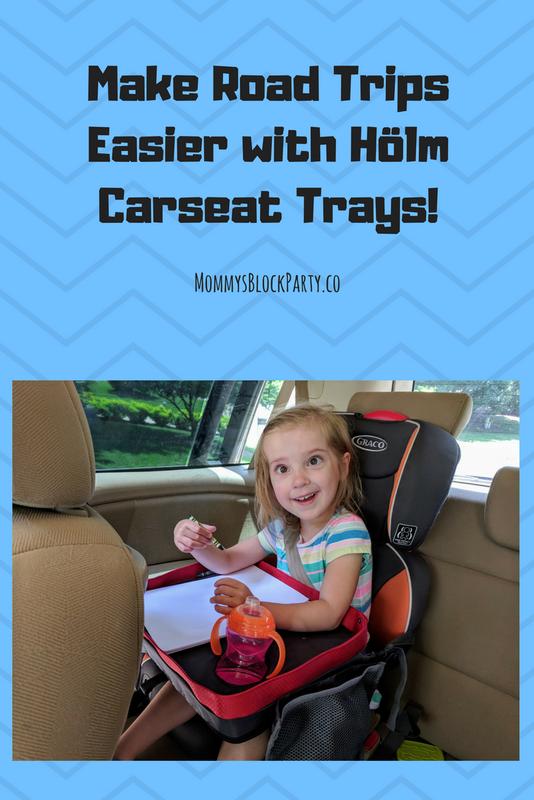 Thank you to Shandali and Hölm Products for supplying me with their carseat trays for my girls to try out! All opinions are 100% my own. This post may contain affiliate links. Who's taking a road trip this summer? Show of hands please! Who is dreading the car trip because they have kids? It's ok, you don't have to raise your hand. I know. 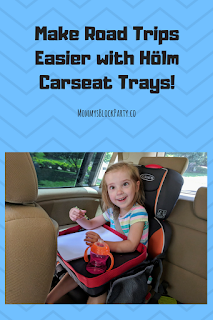 Well, I wanted to tell you all about this cool product that you can use to help make those dreaded trips a little easier - the Holm Carseat Tray! We took a trip to Florida in April to visit some family and go to the beach before it got nuclear hot. With three little ones, ages 7 months, 2 yrs and 4 yrs - we all knew how that was going to go. Let's say, "challenging". My husband only threatened to jump out of the van once. Ok maybe twice. But, I have to say, although the trip was long and we had to stop probably once every two hours (if not more), we had a little secret weapon that actually did help! Joanna, giving Elmo a drink of water on the way to Florida. Gotta keep Elmo hydrated. Friend of MBP, Adam N. with Shandali, sent me two Holm Carseat Trays for my girls to try on the way to Florida. Check out Olivia's face in the picture below. It was a game changer! There were so many new activities that they could do with a tray! 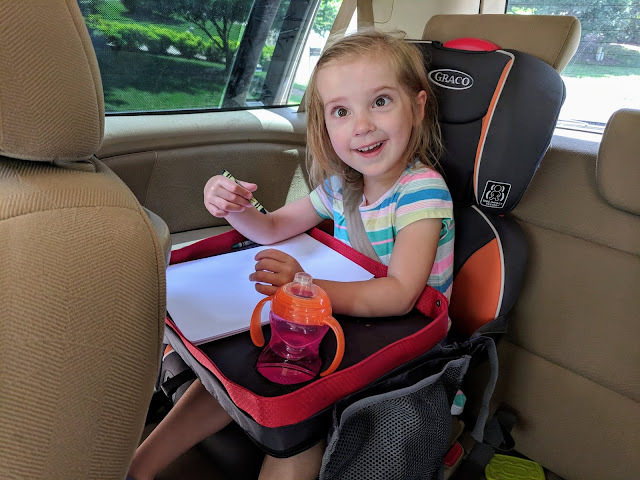 Coloring, reading a book, eating drive thru lunch - and it has a cup holder! Olivia totally elated to have her very own tray for activities! It is super easy to install, you just thread a strap around the seat and clip it together with the other side of the tray. 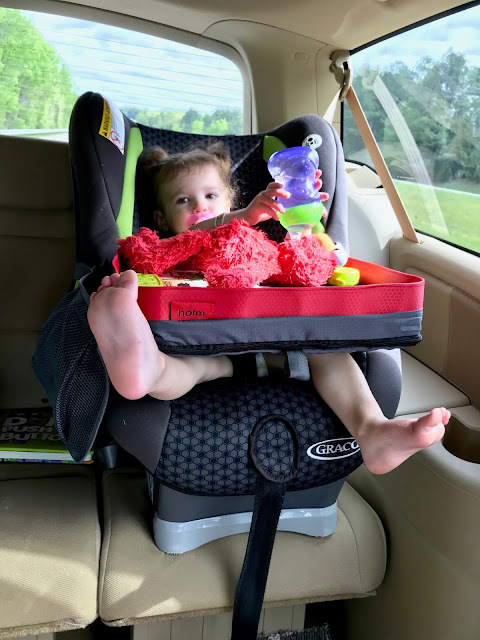 Easy on, easy off - which is such a big deal when you are already fighting with wild toddlers to get in the seat in the first place. It comes with two side pouches too that you can store essentials in like: crayons, puzzles, snacks, tissues, napkins... you know the drill. The cool thing is, it gives the kids something to do and focus on while you drive (in our case, 10 hours in the van.) And, have you ever tried to feed toddlers in a van? Yeah, I have. The best method I have come up with is to keep them strapped into their seats first of all. 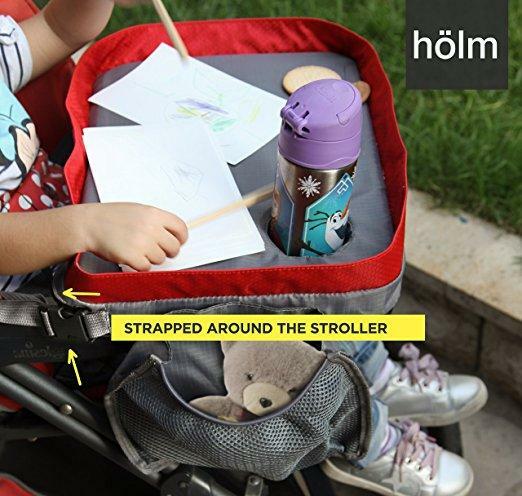 Now, with the Holm Carseat Tray, they can use it as a small table also - drink holder and all - and there is a raised edge around it to catch crumbs! Genius! Here is a neat diagram from Hölm showing some of the features. 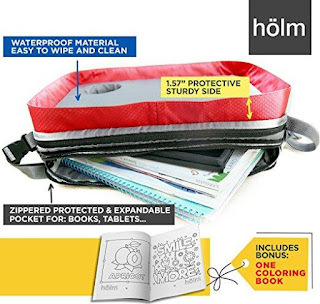 It has a zippered pocket for books and tablets - great feature! A nice way to keep all the books in the van organized! They also send you a cute coloring book so that you have an immediate activity to give your kid. Another cool idea is to use it on a stroller - I haven't tried that one yet but I can think of so many times that it would come in handy - like shopping at Target. Yes, please, have a snack and draw Mommy a picture while I shop the clearance section for a while. Definitely going to try that. If you have little kids, or any form of kid really, I recommend getting one of these little gems for car trips. Or even trips to the grocery store. It may not solve all of your car trip problems, but it definitely will reduce them greatly. 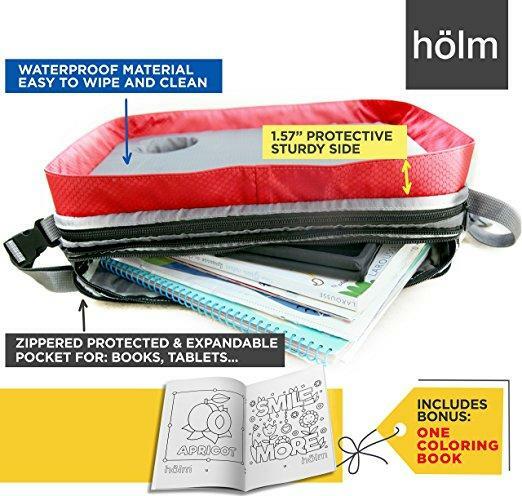 Hölm Products and Shandali are sponsoring a giveaway for our MBP readers! 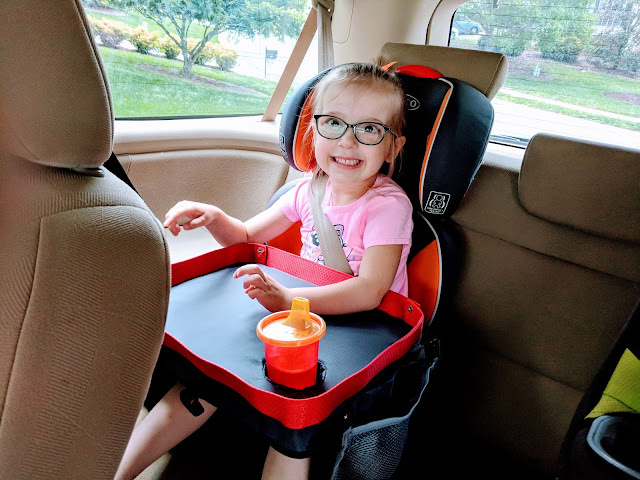 Enter to win two (2) carseat trays (share one with a friend if you only need one! ), a $31.90 value. 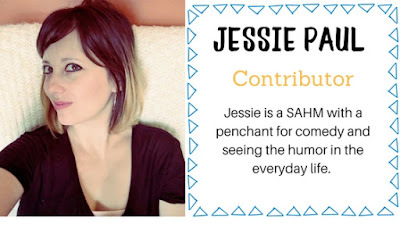 Use the entry form at the bottom of this post. 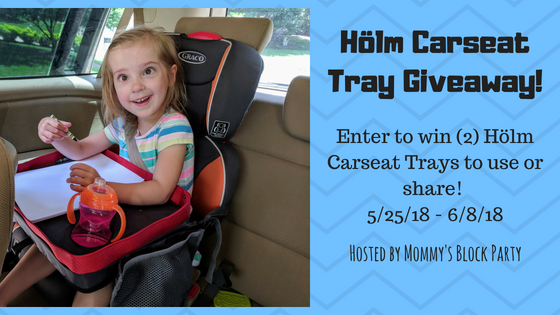 A very special thank you to Hölm Products and Shandali for sending me these great carseat trays to make my life easier and for sponsoring this fun giveaway for our readers! Sooo cool! We would love to try this with our refacing two year old! He is still so tiny but wants to play play play! We have been as far as delaware, which was a 9 hour trip! Love that it can be used on car seat and stroller!!! Yes! It was a great tool - you could take hotwheels or something and let him play with them on it. And the strap keeps it on their lap so it doesn't slide off! My longest road trip was from California to Missouri and it was about a 3-day drive. We drove from PA to FL! 18 hours! I can remember driving from Kentucky to Arizona but only did something like that once. I think driving coast to coast would be really cool. Honestly...I took a road trip from FL to CA once...it was FOREVER! Hah! I love the zippered pockets to hold books and other extras--totally handy! From North Carolina to Arizona, too long. the niece that lives with me just turned 4 when we went to north myrtle beach SC. It was a 9 hour drive. I am not playing. And she did wonderfully. Now my son... he would be a diff story. He does love to ride but I think after a couple hours though his tune may change? I dont know? I love the storage packs on the side. I am always looking through a bag via purse or diaper bag for things my son needs. if I am driving he needs to be able to get it himself. This is a brilliant idea !!! We’re heading on a road trip in a few weeks and this would be great for that! The farthest we’ve gone is almost 24 hours to Utah! We took a three day trip from Ohio to Nevada! I wish that I'd had this on all of the road trips that we took when my son was younger. It looks like such a handy thing to have. I'm definitely going to have to pick one of these up for our toddler- she hates to travel by car, but this might make the trip a little easier on everyone.